30 Nov 2007. Like a naughty delinquent teenager, Nationwide Airlines have been grounded; and it couldn't have come at a worse time for them - start of the Western Cape School holidays, December and to top it all off a Friday. This is going to cost Nationwide a lot of cake, and may even drive the airline under. But before you start feeling too sorry for them - remember that they have only themselves to blame for cutting corners with aircraft maintenance (and thereby endangering you, me, our families, wives, children and friends). We at SouthAfrica.TO sincerely hope they get their act together fast, we feel for the Nationwide staff and passengers, and all South Africans will be the ultimate losers if they go bust. A big blow for the aviation industry. Late on the evening of the 29th November a fax printed its way out at Nationwide's offices giving it the message that South Africa's Civil Aviation Authority (CAA) had revoked Nationwide's aviation maintenance organisation licence, which had failed to comply with the CAA's safety standards. The CAA also suspended the airworthiness certificates of all aircraft maintained by Nationwide. Both suspensions took place at midnight on the 29th November. Practically speaking, this meant all of Nationwide's planes were grounded. "As a result of this action the aircraft that constitute the Nationwide air fleet will not be permitted to undertake any further flights until their airworthiness status has been verified," said the CAA. Was this because of the engine falling off a Nationwide plane? The CAA claim that this was unlinked to the incident on the 7th November when an engine fell off Nationwide flight CE723 on takeoff from Cape Town International Airport. 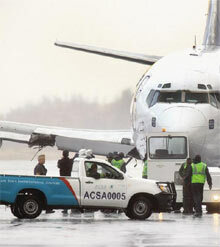 Obert Chakaris, the acting head of the CAA's air safety department told reporters that Nationwide's maintenance department had used the wrong spare parts: "When we were reviewing the package on the aircraft, we discovered that one aircraft has wrong parts and others do not have the correct part numbers." The suspision is that Nationwide were using pirate parts on their aircraft. Although the CAA claim that the grounding of Nationwide was unrelated to Nationwide's loss of engine, their CEO (Zakes Myeza) was quoted as telling parliament shortly thereafter: "Our view on the incidents is that we believe they were isolated. They are not unique to the aviation authority. We have our inspectors on high alert to ensure air worthiness (of all aircraft)." What are the underlying causes? Technical staff of airline maintenance organisations are leaving South Africa quicker than new entrants can be trained to the required level of expertise (as a result of the Government's BEE policy and crime in South Africa). Government subidisation of South African Airways and Mango airlines drove airline prices down, resulting in increased pressure on private airlines to cut costs. A culture of crime developing in South Africa. Poor law-enforcement across South Africa. As you can imagine, not being able to get onto the plane you booked your flight with is a major pain in the neck for passenger holding Nationwide tickets. Nationwide flies mostly within South Africa (Johannesburg, Cape town, Durban and Nelspruit), but also operates flights from London Gatwick to Johannesburg, and from Johannesburg to Livingstone (Zambian side of the Victoria falls). Like a Knight in shining armour, Comair Limited has announced that it will assist Nationwide's customers wherever possible. Both Kulula.com and British Airways flights will accommodate Nationwide passengers on a standby basis (as long as they have had their flight tickets endorsed by Nationwide). Early this morning we determined that the South African Civil Aviation Authority (SA C.A.A.) has suspended our Aviation Maintenance Organization (AMO) license. We apologize profusely for any inconvenience or confusion that has been caused. With immediate effect, all flights have been suspended until further notice. We have approached the C.A.A. for further details and guidance in respect of any actions they would like us to implement that would enable them to reinstate the AMO’s license at which point normal operations will resume. Safety is our number one priority and we will not compromise the safety of our customers or crew. We do not anticipate a prolonged disruption of air service due to the close cooperation that exists between the Civil Aviation Authority and Nationwide Airlines. Once again we apologize for the inconvenience you have experienced. We thank you in advance for your cooperation at this difficult time. Nationwide ticket – holders will be given an opportunity to either re-book or have their tickets refunded. More detailed information will be available from airline customer service personal at airports served by Nationwide Airlines and we will keep you updated on the website. The CAA's Obert Chakarisa mentioned that this was not the first time they had grounded an airline - the airline maintenance organisations of the Nel Air and Executive Aerospace had already been grounded; Chakarisa also said he would be suspending two more airlines in the next week but would not name the airlines. continued safety to an acceptable or required level. undertake any further flights until their airworthiness status has been verified. be consistent with International Best Practice. The decision was taken by SACAA in the interest of continued aviation safety in the country. view is that safety cannot be compromised.